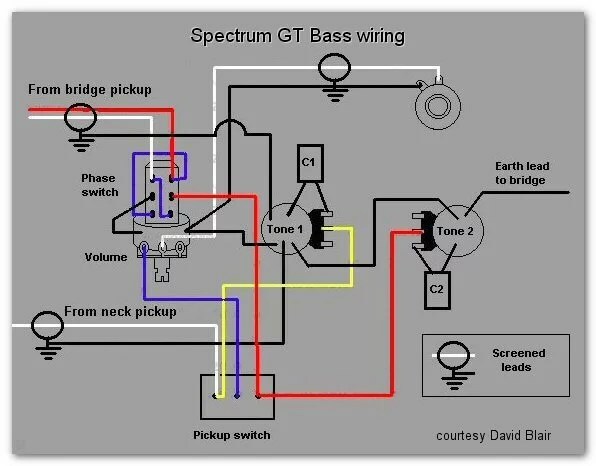 This wiring diagram is taken from a 1986 Spectrum GT bass. It is probably also suitable for the Pantera X750 bass since they have the same pickups (Neck – Magnabass III, bridge – Magnabass IV) and controls (3 way switch, single volume and two tone controls). Both pickups have 4-core wiring internally, reduced to 1 core for the neck pickup and 2 core for the bridge pickup before being connected to the volume and tone controls, so they can both be rewired simply for series/parallel switching or coil tap. Coil tap is probably only really possible on the bridge pickup without modifying the neck pickup. The Magnaflux III (Centre/neck) pickup looks like a split-coil pickup in a humbucker case but actually has full length coils each of which only has slugs/pole pieces under a pair of strings, so one coil pickups up the signal from the E and A strings and the other from the D and G strings. 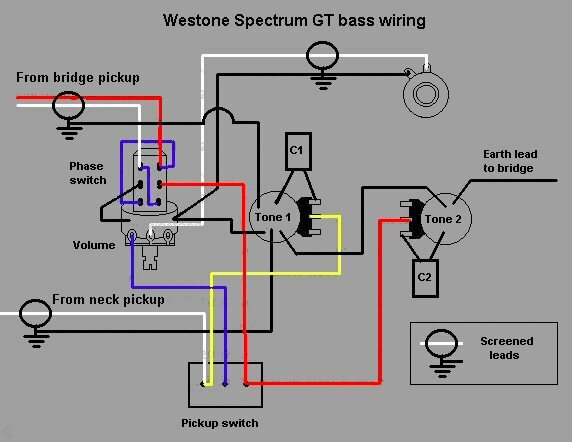 It would be a simple matter to take the back plate off the pickup and add 4 more 6mm pole pices per side, then each coil would pick up the signal from all 4 strings.